You can read more about Rick Snyder’s work on hope via the following link. 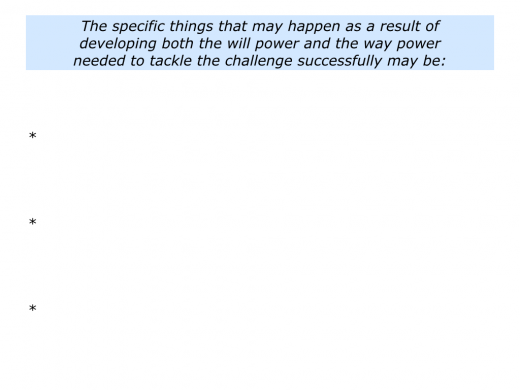 Looking back, can you think of a situation when you developed the will power and way power needed to tackle a challenge? You may have been recovering from a loss, making a transition, managing an illness or dealing with another issue. What did you do to take these steps? You may have taken time out to reflect, gather strength and look ahead. You had the will to tackle the challenge, but at first you may not have seen a way forward. How did you explore the possible options? You may have done lots of research, gathered data, learned from best practice or whatever. After considering the various options – together with the consequences of each option – you settled on your chosen strategy. What did you after choosing the way forwards? You may have focused on what you could control, pursued your strategy and got some early successes. You then kept doing your best to reach the goal. Describe a specific situation in the past when you developed both the will power and the way power needed to tackle a challenge successfully. Describe the specific things you did to develop both your will power and way power. 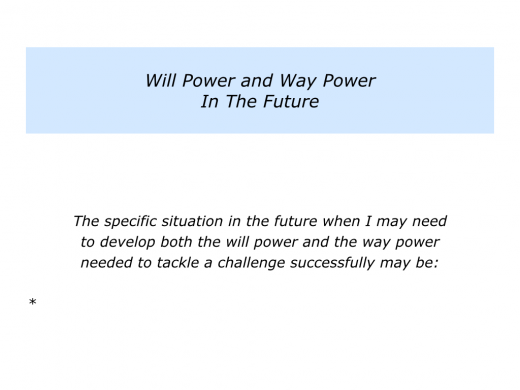 Many people use the will power and way power model in their professional lives. They may do it consciously or unconsciously. Mentors, trusted advisors and educators, for example, know a person must have the will before they can learn a skill. That sounds fine, but what if a person does not have the will required to reach their goal? Is there any way to help them increase the strength of their will? People choose their attitude. It is a person’s choice whether or not they develop the will required to tackle an issue. It is possible to help them to see potential ways forward, however, and this can help to increase their will. Good mentors, for example, often follow the organic approach. This is based on the belief that people already have strengths and successful patterns within them. The mentor can invite the person to recall a time when they have tackled a similar challenge successfully. What did they do right then? How can they follow similar principles – plus maybe add other skills – to tackle the present challenge successfully? Let’s assume a person has the will to tackle a specific challenge. They want to move forwards, but they cannot see a way to reach their goal. Looking ahead, what is your goal? What are the real results you want to achieve? What is your picture of success? The mentor then helps the person to explore the possible ways forwards. They may start by clarifying the options the person has already thought about, together with the consequences. They may then summarise these by saying something like the following. The mentor may ask if it is okay for them to share some other options. They will then aim to pass on knowledge in a way the person can accept and use. They may say something like the following. Is it okay to share some ideas? If so, here are some other possibilities you may wish to consider. Looking at these options, are there any that resonate with you? We can also combine the best parts of each option. If so, we can explore that option further. I can also share some practical tools you can use to pursue this option and do your best to achieve your goals. Good mentors are like good educators. They believe that education is the ultimate democratic activity. It offers people more choices – and therefore more freedom – to shape their future lives. Such professionals aim to increase people’s way power. This, in turn, can help people to increase their will power. People may then feel more confidence about shaping their futures. So how can you help a person to increase their way power? You will, of course, have your own approach to helping a person to increase their repertoire of options. Study what works, simplify what works – hopefully in a profound way – and share what works. I understand and agree with the principle, but what can I do in my own situation? How can I translate these ideas into something I can do tomorrow? People want more than theory. They want practical tools that work. This can help to increase their way power. Looking at my own life, for example, after being diagnosed with prostate cancer I was able to explore the potential ways forwards. This called for looking beyond the older style treatments. Fortunately I found a surgeon who performed two forms of non-invasive treatment. These were NanoKnife and HIFU – High Intensity Focused Ultrasound. I have had both treatments without any side effects. People who experience an illness will feel down for a while, but may then start exploring options. They sometimes find that increasing their options – and their way power – also helps to increase their will power. Let’s return to your own life. Looking ahead, can you think of a situation in which you may want to develop both your will power and way power. You want to do this when encouraging a person, seeking a new job, managing a transition or tackling a difficult challenge. How can you increase your will power? As mentioned earlier, you can recall times when you have tackled a similar challenge successfully. What did you do right then? How can you follow similar principles – plus maybe add other skills – to tackle the future challenge? How can you increase your way power? How can you gather as much information possible in this field? How can you study what works? Bearing in mind what you can control, what is your picture of success? Looking ahead, what are the possible options for doing your best to reach your goal? What are the pluses and minuses of each option? 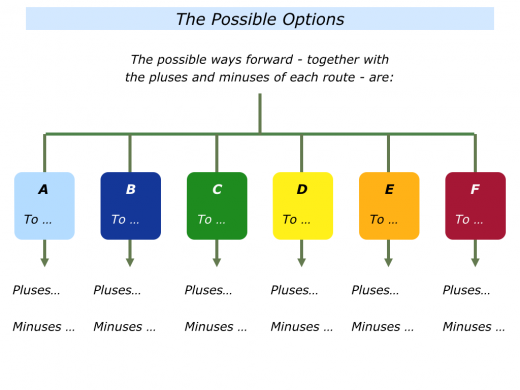 Which is the route – or combination of routes – you want to follow? How can you pursue your chosen strategy? How can you get an early success? How can you keep doing the right things in the right way? How can you encourage yourself on the journey? How can you do everything possible to achieve your picture of success? 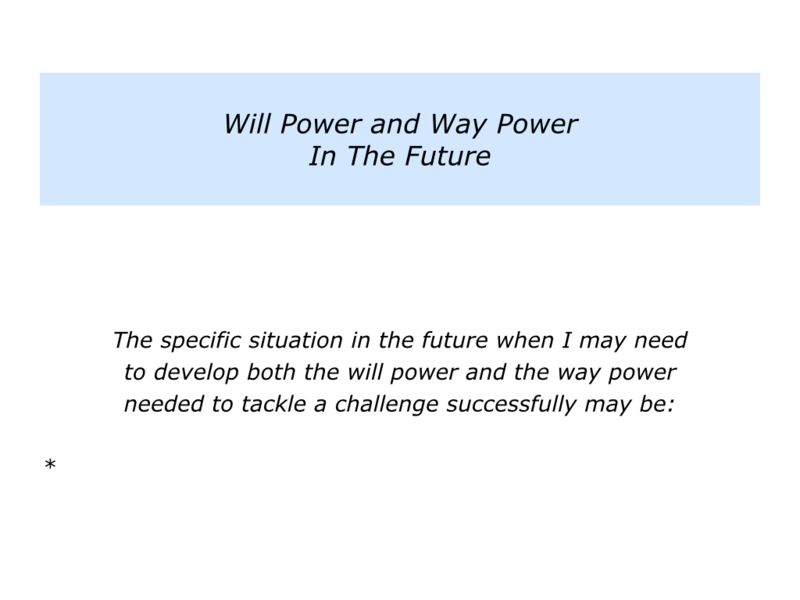 Describe a specific situation in the future when you may want to develop both the will power and the way power needed to tackle a challenge successfully. 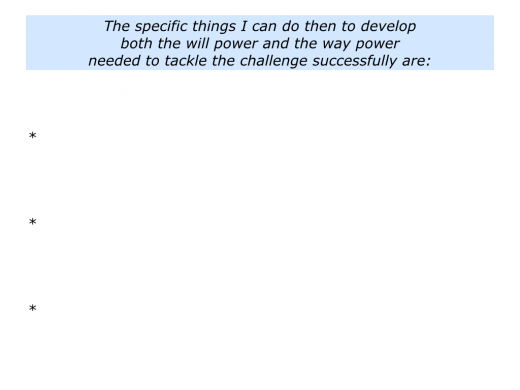 Describe the specific things you can do then to develop your will power and way power.